From the beginning, this tablet appears to be slightly square with rounded corners. The back is made from metal and it appears to be resistant to scratches. The touch type buttons are missing because they were replaced with the swipe effect. At the base of this tablet you will find the microUSB port, the jack for charger and the micro-HDMI port. On the upper side of this tablet you will find the power button with role in locking and unlocking the screen, the volume control buttons and the 3.5 mm jack for connecting a set of headphones. At the front it is placed a video camera with a 3 megapixel sensor which is accompanied by a sensor that adjusts the screen brightness. On the back side is placed the main 5-megapixel camera. The screen is a TFT capacitive touchscreen with a resolution of 1024 x 600 pixels with 16 million colors. It is normal that this tablet allows multi-touch. The sound offered by this tablet is strong but when the volume is used at maximum power, it seems to be slightly distorted. From this point of view, Playbook is a noisy tablet. This tablet brings a dual-core processor clocked at 1 GHz. It is a Cortex-A9 CPU. The graphics acceleration comes from PowerVR SGX540 GPU. They also implemented 1 GB RAM and storage space from 16 to 64 GB. 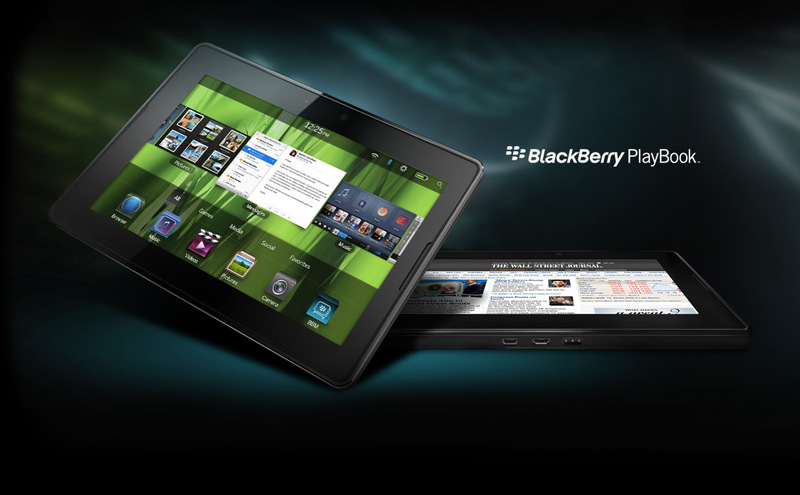 BlackBerry Tablet OS. It is another operating system based on Linux in which RIM has laid the foundation that it will stand out from the competition. With the above hardware is not surprising that browsing is doing great. They implemented swipe so when you will want to exit from an application it will be sufficient to move your finger slightly more pronounced from bottom-up. You can then choose to close or navigate through the features offered. The support for Adobe Flash Player and AIR is integrated. This tablet has Wi-Fi a/b/g/n, microUSB, Bluetooth 2.1, microHDMI and 3G. RIM has brought two top sensors: 5 megapixels which records full HD at 1080p placed on the backside of the tablet and the second one is the 3 megapixel sensor placed on the front side. This tablet brings a 5300 mAh battery that weighs 425 grams with a thickness of 10 mm. It resists around 8 to 10 hours without problems. It is much better than Flyer – another 7-inch tablet with the same resolution, RAM but with single core processor clocked at 1.5 GHz.